Owner of Bushcraft Global, Joe is an avid outdoorsman and instructor. This friendly American lives in the mountains of North Carolina where he freezes his rear off every winter while dreaming of the jungle and the animals in it. 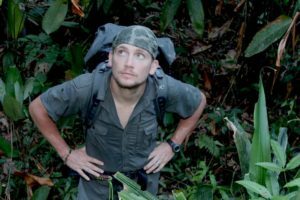 Following his love for the outdoors, Joe Graduated NC State University with a Bachelor’s Degree in Zoology with a Minor in Entomology. All throughout that time, he ventured across the United States and beyond searching for animals, and learning primitive and survival skills. Joe had always been into knives and outdoor primitive living ever since he was a child, and with that, he started writing for Tactical Knives magazine. Since then, Joe has gone on to write for Self Reliance Illustrated, Backpacker magazine, Swat magazine, Survival quarterly, Backwoodsman, New pioneer, Master Woodsman, Equip 2 Endure and American Frontiersman to name a few. Joe’s love for machetes teamed him up with companies like Condor Knives, and his machete and knife designs are well known throughout the knife world. Joe has also worked with custom makers to produce good dependable outdoor knives as well. Joe works frequently with TOPS knives, a US manufacturer and official sponsor of Bushcraft Global, designing for them and brain storming ideas. Joe frequently travels around the world from South America to Europe in search of the outdoor skills of various cultures, and passing them onto everyone. The Global Bushcraft Symposium is a nonprofit society. All organizers of the symposium are volunteers.